Intense and dark in value, Alizarin Crimson mixes cleanly with most pigments to create dark mixtures and warm neutrals. A combination of Aureolin (Cobalt Yellow) and French Ultramarine with Alizarin renders a surprising range of other colours resembling everything from Burnt Sienna and Umber to Payne's Gray, while Alizarin Crimson with French Ultramarine creates an intense purple. 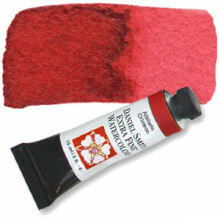 Click the button below to add the Alizarin Crimson Series 1, 15ml Tube Daniel Smith Extra Fine Watercolour to your wish list.